"We tried to do things the right way ... [but] he got sent back." 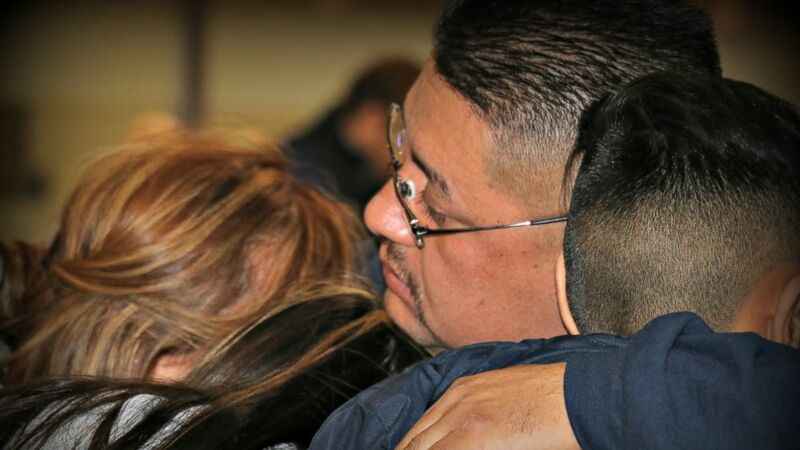 A tearful scene unfolded at Detroit Metropolitan Airport on Monday morning, where Jorge Garcia, a father of two and a 30-year resident of Detroit, was deported to Mexico amid cries from his family. Garcia, 39, was brought to the U.S. by his aunt when he was 10 years old, according to his wife and Michigan United, an immigrant advocacy organization that is working with Garcia. His parents had already immigrated to the country, said Michigan United spokesperson Erik Shelley, who was at the airport this morning as Garcia bid his emotional goodbyes to his wife, Cindy Garcia, and children, ages 15 and 12. (Natalie Gallagher) Jorge Garcia says goodbye to his family at Detroit Metropolitan airport before being deported, Jan. 15, 2018. “It’s like a nightmare,” she said. Cindy and Jorge Garcia met in Detroit and have been married for 15 years, she said. He worked in the landscaping industry and she is retired from Ford Motor Company. In 2005, they tried to “fix his paperwork,” Cindy Garcia told ABC News, but instead he ended up in deportation proceedings. Throughout the Obama administration, Jorge Garcia was able to receive multiple stays of deportation, though he had to check in with Immigration and Customs Enforcement (ICE) routinely. But on Nov. 20, ICE told the couple that Jorge Garcia had to leave the U.S. He was going to be detained, but ICE allowed him to stay with his family, first through Thanksgiving and then through the holidays, Cindy Garcia said. However, he was told he had to leave the country by no later than Jan. 15 -- today. ICE said that its records show that Jorge Garcia, an unlawfully present citizen of Mexico, was ordered removed by an immigration judge in June 2006. He appealed his removal in 2008 to the Board of Immigration Appeals, where it was remanded back to the lower court, which subsequently allowed him to voluntarily depart, according to ICE. After he failed to depart within the timeline of the agreement, he became subject to a final order of removal in 2009, ICE said. ICE exercised what is known as "prosecutorial discretion" in his case in 2011, 2012 and 2014, allowing him to remain in the U.S. During that time, he was never detained by immigration authorities. On Jan. 15, Jorge Garcia was removed pursuant to the judge's removal order, said ICE. "As ICE Deputy Director Thomas Homan has made clear, ICE does not exempt classes or categories of removable aliens from potential enforcement. All of those in violation of the immigration laws may be subject to immigration arrest, detention and, if found removable by final order, removal from the United States," said an ICE spokesperson in a statement. ICE said it wasn't aware of any criminal record for Jorge Garcia. Shelley said that as far as he knows, Jorge Garcia hasn't had so much as a parking ticket. Jorge Garcia's deportation comes amid a yearlong effort by the Trump administration to ramp up immigration arrests and deportations. In fiscal year 2017, ICE arrested 143,470 people on immigration violations -- the highest number of these type of arrests over the past three years. “If you choose to violate the laws of this country, you should be concerned,” said Homan in December -- a sentiment he has repeated in public testimony and interviews. There were 30 percent more immigration-related arrests in 2017 compared to the previous year, according to ICE’s end-of-year report. “It was touch-and-go throughout the Obama administration,” but Jorge Garcia had no chance when President Donald Trump started going for the “low-hanging fruit,” said Shelley. Garcia was two years too old to qualify for the Deferred Action for Childhood Arrivals (DACA) program -- the Obama-era program that allowed some undocumented immigrants who brought the U.S. illegally to work and live in the U.S. without fear of deportation. In September, Trump announced he was winding down the program, but the phase-out is facing a number of legal challenges. Meanwhile, Congress is debating a possible permanent solution for DACA recipients -- a debate that could lead to a government shutdown. ICE did not immediately respond to requests for more information on Jorge Garcia’s case. While politicians fight over a DACA solution, Cindy Garcia remains in limbo, unsure of when her husband will be allowed to return to the U.S.
“It’s like any minute now he’s going to walk through the door, but he’s not, he’s in Mexico,” said Cindy Garcia.